In a sensory system, a sensory receptor is a sensory nerve ending that responds to a stimulus in the internal or external environment of an organism. In response to stimuli, the sensory receptor initiates sensory transduction by creating graded potentials or action potentials in the same cell or in an adjacent one. The sensory receptors involved in taste and smell contain receptor molecules that bind to specific chemicals. Odor receptors in olfactory receptor neurons, for example, are activated by interacting with molecular structures on the odor molecule. Similarly, taste receptors (gustatory receptors) in taste buds interact with chemicals in food to produce an action potential. 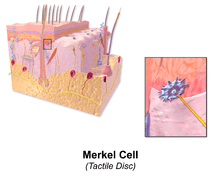 Other receptors such as mechanoreceptors and photoreceptors respond to physical stimuli. For example, photoreceptor cells contain specialized proteins such as rhodopsin to transduce the physical energy in light into electrical signals. Some types of mechanoreceptors fire action potentials when their membranes are physically stretched. The sensory receptor functions are the first component in a sensory system. Sensory receptors respond to specific stimulus modalities. The stimulus modality to which a sensory receptor responds is determined by the sensory receptor's adequate stimulus. The sensory receptor responds to its stimulus modality by initiating sensory transduction. This may be accomplished by a net shift in the initial states of a receptor (see a picture of these putative states with the biophysical description ). 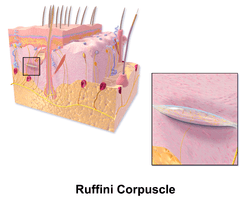 Cutaneous receptors are sensory receptors found in the dermis or epidermis. Muscle spindles contain mechanoreceptors that detect stretch in muscles. Free nerve endings characterize the nociceptors and thermoreceptors and are called thus because the terminal branches of the neuron are unmyelinated and spread throughout the dermis and epidermis. 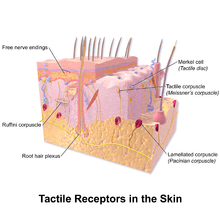 Encapsulated receptors consist of the remaining types of cutaneous receptors. Encapsulation exists for specialized functioning. A tonic receptor is a sensory receptor that adapts slowly to a stimulus and continues to produce action potentials over the duration of the stimulus. In this way it conveys information about the duration of the stimulus. Some tonic receptors are permanently active and indicate a background level. Examples of such tonic receptors are pain receptors, joint capsule, and muscle spindle. A phasic receptor is a sensory receptor that adapts rapidly to a stimulus. The response of the cell diminishes very quickly and then stops. It does not provide information on the duration of the stimulus; instead some of them convey information on rapid changes in stimulus intensity and rate. An example of a phasic receptor is the Pacinian corpuscle. Different sensory receptors are innervated by different types of nerve fibers. Muscles and associated sensory receptors are innervated by type I and II sensory fibers, while cutaneous receptors are innervated by Aβ, Aδ and C fibers. ↑ Michael J. Gregory. "Sensory Systems". Clinton Community College. Retrieved 2013-06-06. 1 2 http://frank.mtsu.edu/~jshardo/bly2010/nervous/receptor.html Archived August 3, 2008, at the Wayback Machine.